Neile Miller, acting administrator of the National Nuclear Security Administration (NNSA) recently had her Facebook account breached by the notorious hacker, who also apparently illegally accessed one of Miller’s personal e-mail accounts. In 2010, Obama nominated Miller, 55, for the principal deputy administrator’s post at NNSA (she was confirmed by the U.S. Senate in August 2010). Following the departure of the agency’s administrator in January, Miller stepped up into the post of acting administrator. Miller, who has top secret security clearances, runs an agency with a broad portfolio of nuclear-related responsibilities, including managing and securing the nation’s nuclear weapons and keeping weapons of mass destruction “out of the hands of state and non-state actors.” The NNSA has a $12 billion annual budget, 2500 employees, and 35,000 other contract workers. Based on screen grabs sent to TSG by “Guccifer,” it does not appear that the hacker accessed any confidential or sensitive material from Miller’s accounts. Though the online outlaw did make sure to swipe photos of Miller with Obama at a White House meeting last year and--as seen above--a shot of her posing at the president’s right shoulder in the Oval Office. 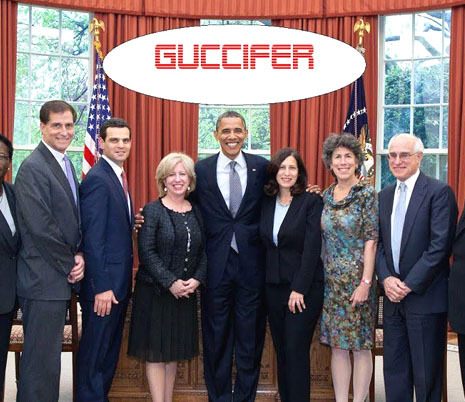 The hacker added the oval “Guccifer” logo to the photo. While it is unclear how Miller was hacked, she was likely an attractive target for “Guccifer” due to her governmental position. The hacker has recently broken into the personal e-mail account of the Obama administration official who heads the National Intelligence Council and the appointee who runs the Pension Benefit Guaranty Corporation.